I know there are plenty of shock threads, but they are getting old and real long. SO, just a little feedback on my new shocks. I have 25k on my 06 RT. The suspension felt ok before, but figured the shocks were shot like everyone says, you don't notice it until you put new ones in. I considered Ohlins and Wilburs, but Ted at Beemer Shop convinced me the Tractive was the way to go. A heads up, I'm not sure if the Ohlins and Wilburs are like this, but the Tractive shocks have larger diameter springs that pose a problem when installing the front shock. The new one contacts the alternator and won't go in without further disassembly. I figured loosening up the alternator was the easiest way to deal with it. That worked, BUT when I started the bike, the battery warning lights were on. I put a voltmeter on it and it was not charging. I shut it down and restarted several times with the same result. HOWEVER, when I revved the engine up, it started charging (13-14 volt range) and stayed charging that way at idle after that. I am puzzled by this. I wish I had a new belt in hand because I did have it off when I slid the alternator back. The belt looked good, no cracking, even when bent backwards. The belt was in the grooves on both pulleys and was good and tight after reassembly. Any Ideas??? I am thinking I may need to replace the belt, but not sure if this problem is related to the new shock install. FYI, I have ESA and went with the manual preload adjuster in the rear on the new shock. I didn't want to take a chance with keeping the electric rear preload adjuster "time bomb". So now there are those 2 plugs not being used. I don't know if there is an obscure chance that's causing the charging issue, I doubt it, but anything is possible with electronics. AND a first impression on the shock performance from a short ride, yes there is a difference, much smoother, BUT not an amazing difference. I think my stock shocks probably had a little bit left in them, but I'm sure that was a time bomb too. A few possibilities on your charging issue. 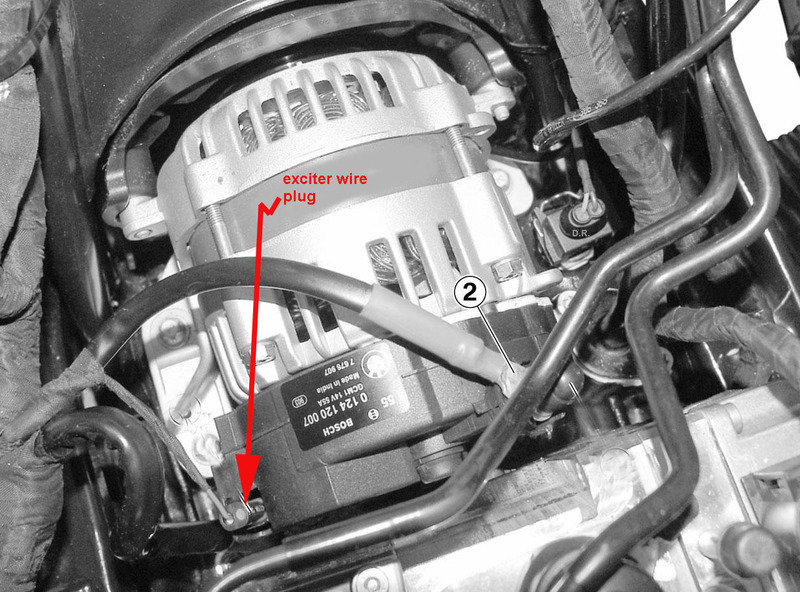 The charge initiation is controlled by the ZFE module with that blue wire running to the alternator, so any chance that you damaged, pulled loose, or disconnected that blue wire to the alternator? They will start charging without that blue wire/ZFE control but the engine usually has to be revved up to initiate charging after starting if that blue wire/ZFE isn't functional. If your (no-start-of-charge-without-revving) returns after the next cold start then look into that blue wire circuit, if it is OK after the next few cold starts then possibly was just a slipping belt. 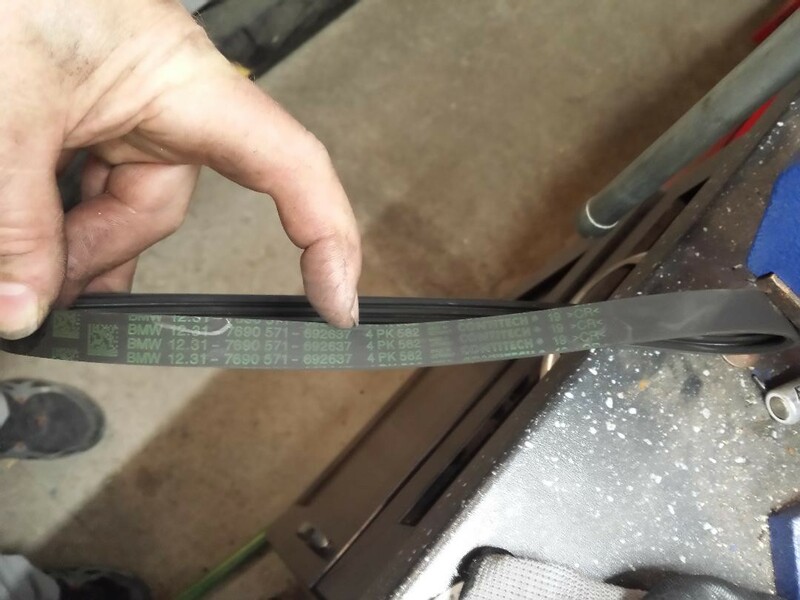 I don't think that leaving those strut control wires disconnected would cause your problem as neither front or rear are directly on the CAN (CanBus) so they shouldn't need any termination resistors to prevent CAN RFI disruption. The ESA does report over the CAN but that is after the ZFE processes the signals. Thanks DR, I knew you would be all over this. You are awesome. I will check the blue wire. I only scootched the alternator back a half inch, so not sure if that wire is tight/ (no play in harness) to begin with, but I will check it. FYI, there was no squeeling. I will almost for sure change the belt ASAP. Please take a look at the belt/numbers and let me know what belt I should put back on. I guess I will get it from the boneyard, they could also inform me as well. I will check that blue wire and get back to you. Any chance I could check the ZFE module/charge signal with the HEX scanner? Seems to happen every time I start it. Where is that blue wire anyway? Probably on the back of the alternator, right? The only thing that m-i-g-h-t show up is if a failure code is caught, but even then, it would probably show something like low system voltage so that would only tell you that you have an issue not what is actually causing it. It does sound like that blue wire circuit if it happens at every engine start. (no guarantee but a darn good place to start). Well you nailed that, as usual. There is no play in that harness, so when I moved the alternator back even just a half inch, that plug pulled out just a little bit. You are the Oracle. Thanks so much.